September 2014 Web Mailbag | Armchair General Magazine - We Put YOU in Command! 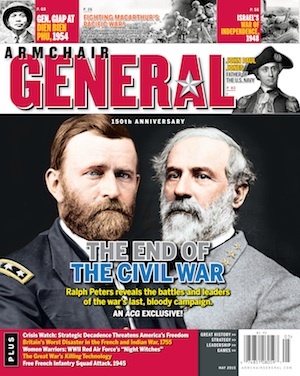 I just finished reading your May issue of the Armchair General. I was particularly interested in the story on page 26 entitled: “Task Force Faith” by John Walker. I was there. I was a young kid still wet behind the ears. I was a Marine sniper attached to the 1st Marine Regiment with Chesty Puller and later with the 5th Marine Regiment under Lt. Col. Ray Murray. In those days snipers worked out of Regimental Headquarters. I went over to Korea with the Brigade (I was fresh out of sniper school at Quantico). On page 30 author Walker says: “In zero-degree weather, the Chinese prepared to strike that night.” Actually it was colder than that. A lot colder. That was the coldest winter in Korea in 100 years. I was on the plateau at Koto-ri and on the night of December 9, 1950 the temperature plummeted to its lowest levels of the entire campaign. I knew it was cold, but never actually knew just how cold it was until about 60 years later. In his book Give Me Tomorrow on page 178 author Patrick K. O’Donnell writes: “According to the meteorological officer assigned to 1st Marine Division, the mercury dropped to -60 with a 65 knot wind. The combination created a wind chill factor of -124.” Now that’s cold. Really cold. That night I got my third Purple Heart. I took 13 slugs from a Chinese burp gun in my right shoulder. Lucky for me it was so cold. My blood froze and perhaps kept me from bleeding to death. And my feet, hands, ears and nose all had frost-bite. The Chosin reservoir was one bad neighborhood. Thousands of Chinese froze in their own sweat. I tell you that was the far side of hell. In the blowing snow you could see what appeared to be a sea of humanity moving slowly along. It was as though a whole field got up on its feet and walked forward with bugles blowing. And now … 60 years later, every time its starts to snow at night, I find myself listening for the pop of a flare overhead and the sound of Chinese bugles signaling an attack.